USING THIS MODEL OF GONDOLA ON ANY OTHER SITES WITHOUT PERMISSION OF AUTHORS AND ADMINISTRATORS IS PROHIBITED! ATTENTION! FOR CORRECT USING OF THIS GONDOLA YOU NEED TO DOWNLOAD SOUNDS #2 FOR FREIGHT CARS AND CARGO PACK FOR GONDOLAS #1 FROM THE SITE http://www.trainsim.ru! 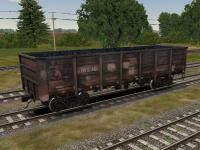 Names of goods indicated in the readme_2 of cargo pack #1.Wagon adapted to the Open Rails and Russian Train Simulator. ATTENTION! 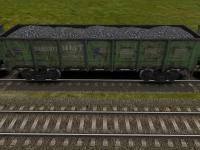 FOR CORRECT USING OF THIS GONDOLA YOU NEED TO DOWNLOAD SOUNDS #2 FOR FREIGHT CARS FROM THE SITE http://www.trainsim.ru! RZD (Russian Railways) gondola car, type 12-753 #61018289 empty and with timber load.